Note regarding this Retro Hugo sub-series of Scide Splitters: The November, December and January Scide Splitters blogs will be devoted to examining humorous stories eligible for the 1941 Retro Hugo Awards being presented in Kansas City at MidAmeriCon II next August. November will cover three novellas, December will look at seven novelettes, and January will include twenty short stories. This will not be exhaustive coverage of all humorous SF/F stories published in 1940 (the eligibility year for the 1941 Retro Hugos). It is limited to those works I have readily available to me without having to dip into the funds that I am saving to attend the convention. I estimate that these stories represent about forty percent of the eligible humorous works and, of course, only a small fraction of all eligible stories, humorous or otherwise. Reader input pointing out stories I have missed will be most appreciated. Click here for more Amazing Stories coverage of the 1941 Retro Hugos. I have a real weakness for the Retro Hugos, more so than for the regular Hugo Awards, and this is largely due to nostalgia. No, I wasn’t alive in 1940, but that doesn’t change the fact that many of my formative “Golden Age” readings were of stories written during the “Golden Age.” Some of my earliest SF/F exposure included Asimov’s I, Robot, Heinlein’s The Past Through Tomorrow, and de Camp & Pratt’s The Incomplete Enchanter. And it just so happens that each of those volumes included stories first published in 1940. Two of the three novellas I will be exploring today are ones that I read at an early age, albeit in modified form as they were incorporated into The Incomplete Enchanter. My reviews here, however, are of the stories as they appeared in their original form published in Unknown Fantasy Fiction. Even though all three were advertised as novels when first published, I have confirmed that all three are of novella length (17,500 to 40,000 words). The current Amazing Stories list of eligible novels and isfdb.org both erroneously list The Indigestible Triton as a novel. That classification problem is something to consider in general as discussion of novel and novella nominations move forward. Be aware that many stories considered to be novel length back in 1940 fall under the current Hugo classification of novella. While it is the normal custom of Scide Splitters to avoid spoilers, that will not be the case for these Retro Hugo reviews. If you wish to avoid having the plots spoiled, skip to the last three paragraphs of this blog for my general assessment and recommendation regarding novellas (humorous and otherwise) that I consider worthy of Retro Hugo nominations. 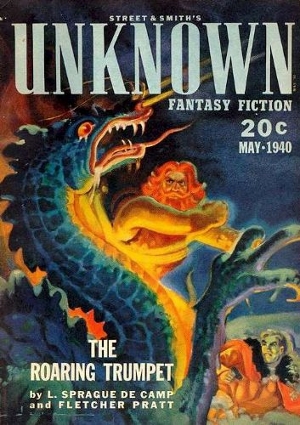 “The Roaring Trumpet” by L. Sprague de Camp and Fletcher Pratt – Originally published in Unknown Fantasy Fiction, May 1940. Despite the potential dangers, Shea, eager for adventure, decides to take the theory into the experimental stage. He resolves to visit mythological Ireland, but ends up in Norse mythology as Ragnarök approaches. Here he meets all manner of Norse gods and is mistaken for a sorcerer, a falsehood he continues to maintain at the advice of others. 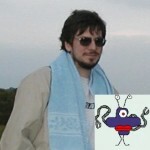 The psychologist comes to observe that adventure is, “Somebody else having a hell of a tough time a thousand miles away.” But he remains confident that he will be able to convince others that he is in fact a sorcerer because he has come equipped with 20th century gadgets that will dazzle the natives. Unfortunately, he soon finds that none of these work because they operate on the fundamental assumptions of his world, a world governed by the laws of physics. These failures come in a series of well-played comic scenes while on a quest to rescue Thor’s hammer. 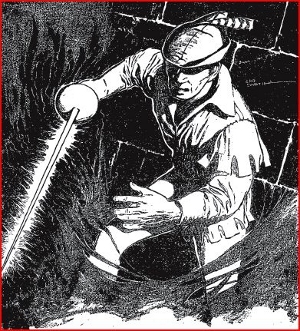 During the successful attempt to liberate the hammer, Shea becomes a prisoner of the Fire Giants. To pass the time in his prison cell, he races cockroaches with the Norse god Heimdall, his cellmate who has given up hope of escape and fears that the Giants will be victorious during Ragnarök. Shea gets an idea to outwit the troll jailer who has an inferiority complex due to his large nose. He offers to shrink the troll’s nose in exchange for help in escaping. The idea is to trick the troll into thinking that his nose has gotten smaller by having all the prisoners attest to it being smaller. To everyone’s surprise, Shea’s spell actually works. They escape the dungeon but are pursued by giants and are progressing too slowly to reach the other Norse gods in time. Shea realizes that the laws governing this reality have a consistent internal logic to them, and so is able to fashion magic brooms that he and Heimdall fly to reach Odinn before Ragnarök begins. Shea, however, does not get to find out how the final conflict ends, having been compelled back to his world by the magic of a spae wife. The later version included in the novel The Incomplete Enchanter differs very little from the original with the primary difference being that Gertrude, the nurse from Shea’s world who appears at the beginning and end, does not exist in the original. The story succeeds both as adventure and as comedy. The general tone of the story is whimsical and the interplay between Shea and the Norse gods is quite humorous. And the underlying concept undoubtedly inspired many a young fan to attempt to fill their minds with the fundamental assumptions of another world. I never got it to work for me, but it was fun trying. “The Mathematics of Magic” by L. Sprague de Camp and Fletcher Pratt – Originally published in Unknown Fantasy Fiction, August 1940. 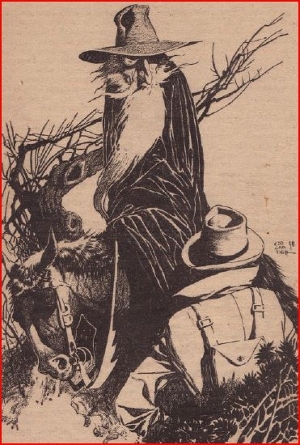 The second of de Camp and Pratt’s Enchanter stories begins where the first left off. Shea, dressed in Norse garb and ravenously eating several steaks in a public restaurant, is debriefed by Professor Chalmers, his colleague and the originator of the theory behind world transference. Chalmers wants to accompany him on his next adventure, something Shea is leery about because the professor is fifty-six years old and leads a sedentary life of theory rather than action. They set their sights on the world of Edmund Spenser’s Faerie Queene, a 16th century epic poem. It is a land of chivalry, chastity and jousting tournaments. Shea goes in the guise of a gentleman squire equipped with a fencing épée since he can’t find a proper sword. Chalmers is dressed as a pilgrim. Upon arrival they get into the first of many confrontations. Shea must battle a knight in order to gain admittance to a castle. Here they meet Britomart, a female knight who can best all the men in the land at jousting. They also learn that the land is beset by a plague of black magic. The story proceeds with a continuous string of encounters, battling knights, a tournament, fighting various creatures, and on and on. It is, to a large degree, a parody of the sort of medieval adventures found in Arthurian tales. Along the way, Shea falls in love with an expert archer who saves them from giant ape-men, and Chalmers falls for a mysterious woman who turns out to be conjured out of snow. The two adventurers eventually learn that a cabal of sorcerers plots to overthrow the kingdom. They attempt to infiltrate the organization and Chalmers must demonstrate his powers to gain admittance. He tries to summon a dragon and ends up summoning one hundred vegetarian dragons that proceed to much on the grass and bushes. It is one of several comic magical failures that include misfires like summoning a rhinoceros rather than a unicorn. Near the climax, Chalmers falls prey to the lure of research offered by the cabal and he plans to learn enough to make his snow woman into a real woman. Shea is forced to proceed without his colleague, though as one might expect, Chalmers does pull out of it in time to play a critical role in the final battle. In the end, Shea finds out that the woman he loves is engaged. And he ends up in a situation in which he has little choice but to use a spell that will save her life but blast him back to his own world. Chalmers stays behind with his conjured companion. Like the first story, the authors manage to strike an enjoyable whimsical tone. The parody, if you are familiar with stiff chivalrous knights and fixations on female chastity, is hilarious. The version appearing in The Incomplete Enchanter differs in a number of ways. Most notably, in the novel, Shea returns to his world with his dream girl, the lovely archer Belphebe. Not so in the original where upon returning he orders a fifth a rye to drown out his bout of unrequited love. The version in the novel also has a few scenes that did not exist in the original, including a very funny segment in which Chalmers tries to bring a parrot back to life to demonstrate white magic but ends up summoning the Blatant Beast. Other than the absence of that particular scene, the original is equal to or better than the modified version. 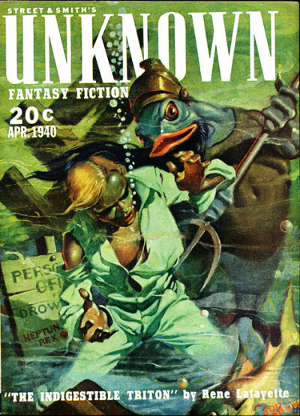 “The Indigestible Triton” by L. Ron Hubbard (as by René Lafayette) – Originally published in Unknown Fantasy Fiction, April 1940. Unlike the previous two stories, this one has been effectively buried by the sands of time. I can’t say for sure why this has been out of print for over sixty years, but it might well be perceived as too over-the-top wacky for a broad audience. It also has some attitudes and vocabulary that would be unwelcome in today’s culture. So while I don’t expect this story to be resurrected any time soon, I must admit that it is exceptionally funny and entertaining. Bill decides that the only way out of this is to fake insanity and eventually force the family to accept Ginger when they realize that she makes him sane. He is bundled off to Balm Springs sanitarium in Florida. Unfortunately the proprietor of the establishment, Doctor Cotter, sees Bill’s wealthy family as the gravy train that will pay off his debts. And so, Bill remained confined long after it was clear that he was sane. Feeling that being cooped up for so long would indeed drive him nuts, Bill bribes the guards to let him step out for a six hour fishing excursion. While away, Doctor Cotter makes a surprise inspection, finds that Bill has escaped, and, fearing his financial ruin, contacts the police to let them know that a lunatic is on the loose. Eventually, after learning of Bill’s troubles, Trigon decides that the best revenge would be to get him locked up forever in the sanitarium. Trigon stretches Bill’s mouth unnaturally wide and climbs inside him, effectively taking over the motor controls his body. Bill can still speak, but so can Trigon, and the competing voices don’t help Bill’s case. From here, the story progresses through a series of crazy scenes. I won’t detail all the action that follows because some of the pleasure of reading this story is its unpredictability. But I will say that I got a kick out of Triton’s raging dialog. The scene on the dock with the police is priceless funny. Now the important question is where do these humorous stories stack up against the competition for Retro Hugo nominations? I feel that all three of these are strong candidates (that will not be the case with all the novelettes and short stories I review in the next two installments). The two Enchanter stories are fairly well known and respected, so I think that one or both stand a good chance of getting nominated. The Hubbard story is more obscure and its chances will depend on how many people happen to read it. Even then, as mentioned, it might be too over-the-top for some people’s tastes. Another contender, at least for my nomination ballot, is Jack Williamson’s “Darker Than You Think.” I’ve only read a few other novellas from 1940 and none of them are strong enough to make the cut. So that leaves me with 6 candidates for 5 slots, though I remain open for further reading suggestions. 8 thoughts on "Scide Splitters: 1941 Retro Hugo Eligible Novellas"
Excellent question, and you’ll probably find many examples where there are tough calls to make. But in this case the expansion is, as you say, significant, not too far short of double the original length. I would reluctantly say that in this case they’re two substantially different works, and you would have to read the “correct” one to judge its merits. It’s a pity, because I also have only the longer version, in the recent Gollancz reissue of The Past Through Tomorrow. Haven’t read it, though. It’s quite clear that, for present purposes, “If This Goes On …” is a novella. The original 1940 version clocked in at about 33,000 words. It is the expanded version that appeared in REVOLT IN 2100 (1953) that sails well past the novel threshhold at 57,000 word. But that raises another dilemma. Is it appropriate to nominate a work when you have only read a significantly expanded version? The only copies I have of “If This Goes On …” are in The Past Through Tomorrow and Revolt in 2100.